Let’s start this one with a BIG NUMBER. To quote the web site of the Alliance for Water Efficiency, “The efficiency of overhead irrigation, such as rotors and pop-up sprayheads, is typically 50 percent and rarely exceeds 70 percent. The efficiency of a well-designed drip irrigation system can reach nearly 100 percent.” This indicates that irrigation efficiency could be as much as DOUBLED by converting to drip. Or, to put it more graphically, the same amount of irrigation would be accomplished using HALF THE WATER! System-wide, that would be a VERY BIG number. But wait a minute. Take a close look at the irrigation “system” in the above picture, a not at all atypical scene along the streets of my city, Austin. That 50-70% efficiency estimate is for a “designed” spray system – using rotors and spray heads, laid out in a pattern that provides head-to-head throw of water, uniformly covering the area to be irrigated, and hopefully with the spray arcs set so that very little water sprays over areas not intended to be irrigated, like sidewalks and driveways. What do you suppose the “efficiency” of the spray operation in the picture would be, spreading much of the water on the sidewalk and street? Maybe 20%? Or less?! Now sure this picture was selected exactly because it serves as a particularly bad example, but as noted it is not all that atypical. One morning, I rode my bike through my South Austin neighborhood and took note of all the irrigation going on that day, at about 25 houses in all. Of those, only a couple were “solid set” systems using pop-up spray heads. The rest were hose-end sprinkler applications. And in only one of the operating systems was there no overspray onto pavement! Most of them were dropping A LOT of the water onto pavement, creating rivulets running along the curb, just like we see in that picture above. It’s a small sample of the entire city, to be sure, but it indicates that these low-efficiency operations are more common than well-designed spray systems. So it may be that converting those irrigation operations to subsurface drip would perhaps TRIPLE – or more – the efficiency. System-wide, that is a VERY, VERY BIG number! As the title of this piece notes, it would be sort of like a whole new “reservoir” for your city’s water supply. A “reservoir” of relieved capacity at just time it is most needed! That’s because water savings obtained by increasing irrigation efficiency comes directly off the peak demand, since that is driven almost exclusively by irrigation water use in this region. And it was purported by the City of Austin that a growth in peak demand created the need to build the new water treatment plant it is presently constructing sooner rather than later. So, as is no doubt the case in many cities, measures to increase irrigation efficiency would be particularly valuable to the overall system, allowing sufficient service to be provided without having to increase their peak supply capacity. Yet these measures generally remain quite neglected, in terms of any programs explicitly aimed to stimulate, promote or require them. This highlights that increasing the efficiency of irrigation operations could be a huge water saver. Not in one big fell swoop, but by the multiplicity of many, many small actions. And that is probably why aggressively pursuing irrigation efficiency has been pretty much neglected as a part of most city’s water conservation programs – it would require the stimulation of many individual actions, through education, incentives and/or mandates. The city bureaucracies no doubt consider that “too hard” – much easier to just build more capacity, which is under its unilateral control, they think, even though an ever-expanding supply is not sustainable. And, as just noted, is unlikely to be the most cost efficient strategy. To move toward sustainable water, it’s clear we will have to take on “distributed” measures like irrigation efficiency at some point. So why not now, BEFORE we put ourselves in hock for expanded peak supply capacity that could be avoided? The application efficiency – accurately routing the water onto the plants you want to irrigate – is only part of the overall efficiency. Other aspects must also be addressed to maximize the savings. One of them is the quality and depth of the soil. The more soil over the irrigated area and the higher its “sponge effect”, the more water it can hold, so more water would be held in the soil until the plant roots can take it up, rather than draining through the soil and being lost to the plants. Because more depth of good quality soil also allows more rainwater to infiltrate and holds more rainfall in the root zone, irrigation can be delayed longer after a rainfall, also saving water. And because improving the soil reduces runoff, so blunting stormwater management problems, it’s a win-win-win sort of strategy. Requiring a minimum depth of soil was urged by a resolution of Austin’s Resource Management Commission in early 2006, and was considered by the water conservation task force later that year, but it wasn’t included in the water conservation program, reportedly due to objections from builders. You see, builders are totally focused on the installation cost and aren’t impacted by the long-term costs of having to “over-water” because there’s not much soil there to hold the water. So the city, in its infinite wisdom, chose not to impose that cost on the builders, rather to in effect subsidize them by enduring the inefficient irrigation that results, so driving a perceived need to provide more water treatment capacity, for which the rest of us will pay. This illustrates the insidious nature of allowing today’s first cost issues to dominate what should be a long-term strategy. This is a ubiquitous problem plaguing many efforts to instill deep conservation practices. Another aspect of irrigation efficiency is watering at the optimum time. You don’t want to lose water to runoff or leaching below the root zone because watering took place when the soil was still “too wet” – either because the area had been recently watered or because there had been recent rainfall. To maximize this aspect of efficiency requires either real-time expert management, consistently applied – which simply does not happen, is not practical, for most irrigation systems – or using an irrigation control system which can sense when irrigation is needed. “Smart” irrigation control systems that can do this are readily available, and are cost efficient for high usage systems, where savings would be most significant. All these factors highlight the importance of good system design. As noted, it is likely that a lot of irrigation water runs through systems that are not designed at all, rather are simply a movable sprinkler at the end of a hose. As noted, those hose-end systems may operate at very low efficiency. 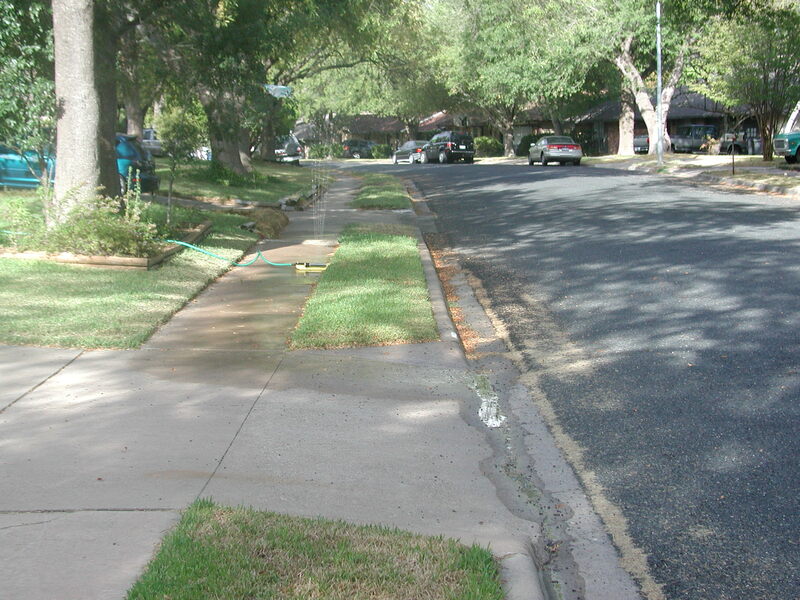 Look again at the picture, at the low regard for watering efficiency exhibited by setting the sprinkler on the sidewalk. Now I would speculate that the person who did this is not doing it because he is dumb, rather he is simply using the piece of equipment that he has, to get water onto the parkway strip between the sidewalk and the street. He is doing this, so gratuitously wasting a lot of water, rather than financing a highly efficient drip irrigation system, which is exactly the best way to water areas like the parkway strip between the sidewalk and the street in that picture. And no one is really telling him he should not be wasting water like that. The Austin Water utility’s propaganda does say that intentionally spreading water on pavement is considered illegal, so I don’t mean that literally no one is telling this person that “irrigating the sidewalk” is not legal. I mean that he is not receiving any signal through either the billing system or through any incentive program that wasting water in this manner is not in the public interest, that it is so economically inefficient, that he – and all the rest of us – are paying for his wastefulness by financing increased water supply capacity, needed only for peak demands that are driven by that wastefulness. It is also notable that considerable efficiency may be gained simply by better educating people who are using well-designed systems about the actual need for irrigation. One city’s conservation department compared actual irrigation rates to ET (evapotranspiration) rates obtained from weather stations and found that most users were drastically over-irrigating. This launched an effort to educate their irrigators, which reduced irrigation water usage city-wide substantially. All this highlights the systematic neglect of irrigation efficiency on the part of most cities. It seems rather basic that they need to examine the various means of increasing irrigation efficiency that were reviewed above. They need to come up with estimates of the system-wide water savings that could be attained by widespread application of those measures and of the costs of implementing those actions. This then would reveal the price of this “relieved capacity”, and that could be compared with the price to be charged for adding that same supply capacity to the system. Then the city could incentivize deep conservation actions, like highly efficient irrigation systems, at the level that reflects their real value to the overall water supply system. Or they could mandate those that are clearly fiscally efficient for the end user (despite perhaps being more costly to the builder) – like requiring drip irrigation in all new projects – to forestall, or even avoid entirely, having to do things like spend a billion dollars to expand treatment capacity. So back to that person who set the sprinkler on the sidewalk, you’ve got to figure out if the fiscal signals you can reasonably send will influence this behavior in a meaningful manner, and if not, then how efficiency could be enforced in order to proliferate it. This is an effort that most cities have so far chosen not to pursue, and so irrigation efficiency, despite that BIG NUMBER noted at the beginning, remains a neglected stepchild. Changing this might have, by itself, allowed Austin to delay construction of its new water treatment plant by a decade or more. How many more cities could, in essence, gain a new reservoir’s worth of capacity simply by investing aggressively in irrigation efficiency? This entry was posted on March 11, 2013 at 11:47 am and is filed under Uncategorized. You can subscribe via RSS 2.0 feed to this post's comments. I agree David, distributed measures are important. Unfortunately some politicians and municipal officials wait too long to implement these measures. However, my hometown (Stratford, PE, Canada) is attempting to be proactive, implementing distributed water efficiency measures now, before the town has water shortage problems. The town has purchased rain barrels as part of a pilot project and is distributing these to residents. You would think that with 1.2 meters (4 feet) of precipitation annually, that we would be immune from water shortage problems. Alas, neighbouring Charlottetown (the province’s capital) is feeling the pinch from water shortages now. They are having to be reactive in dealing with the problem and getting a new central well up and running sooner than planned. A common problem in our region is illegal basement sump pump connections into the sewer system. Clean groundwater that seeps into basements is pumped into the sewer systems, turning it into “wastewater” and overloading the WWTP. So the Town hopes the rain barrels will also help with this problem by intercepting a lot of roof water that would normally flow down along the foundation wall making its way into those basement sump pumps. They will be following up on the installations and comparing before and after data for the central water supply and at the sewage treatment plant. Thanks for those observations, Kelly. Highlights that, while the exact nature of the problem varies by region, we are all in the same boat — water is getting much dearer, and we all need to get after water efficiency, after deep conservation. Portland, Oregon provides tax incentives to property owners that disconnect their roof drains from the city’s stormwater drains. Could a similar plan be used for property owners that increase their irrigation efficiency? Great question. Tax incentives are used by cities for any number of things that the city leaders assert will provide benefits that would offset the loss of tax revenue. So irrigation efficiency, installing a more regionally appropriate landscape that doesn’t require much irrigation, improving the soil, rainwater harvesting, wastewater reuse, etc., “should” all be considered for incentivization by such means. Now if only our “leaders” would go ahead and use that tool for the purpose of moving us toward sustainable water, instead of just for the flavor-of-the-month development project, we might actually move toward sustainable water. In some of my training sessions with Dottie Woodson, she’s shown lots of pictures of drip systems going in for turf areas. Seems that drip is required for new commercial landscapes in some municipalities of Texas. Of course, the other component is choosing new types of turf (like Habiturf) and native or adapted landscape plants that are drought resistant. Thanks for putting this info out there, David. It can’t be said enough. Thanks for the note, Vicki. Yes, there really is no good reason why all commercial landscapes should not require drip irrigation, and indeed also require that the drip system be fed by site harvested rainwater and/or project-scale “waste” water reclamation. But, sadly, such practices are not even on the radar screens of most cities, if any. You have introduced my favorite example of water waste and have done very well to show this is a tremendous quantity of water that can be saved for thirsty people instead of thirsty lawns. On my hour long commute from Boerne to San Antonio I routinely see (and photograph) large quantities of water running down the streets from excess watering of turf. In a 2012 San Antonio Express News interview about the ongoing drought, SAWS Conservation Director Karen Guz noted in 2011 that the turf covered medians within the Stone Oak area, north of San Antonio, consumed 30 million gallons of water outdoors for irrigation. In contrast, in the same general area, North Central Baptist Hospital used 28 million gallons indoors. When the City of San Antonio was flirting with stage three drought restrictions last summer—restricting landscape watering to once every other week, Guz revealed that 70 to 100 million gallons of water were being used by San Antonio residents each day on landscaping. The Texas Water Development Board estimates that 40 percent of all municipal water use is outdoors. Of that, half is lost to runoff from the excessive watering of lawns. This is drinking water that is simply wasted. This is water that could easily be conserved. Reduce demand, increase supply, change the culture. Thanks not only for doing your part, but for teaching others better ways of using our water resources. Thanks for those observations, Milan. This is an area where we certainly have the capability to pretty immediately make a dent in water use. It’s “just” a matter of finding the political will to incentivize — or impose — efficient practice. That no one seems to think they “should” is a disappointing observation on the nature of society, no? Good discussion. I often ask installers if I can install a drip irrigation system in for turf . . . I am routinely told that drip irrigation systems do not work well with turf or will not last as they get clogged, etc. Do you know of companies that install drip irrigation systems for turf? I am not a big turf fan, but where I have to install it, I would like to use drip irrigation. Thanks for those great questions and observations, Terry. “Drip doesn’t work for turf” and “Drip will always get clogged” seem to be persistent myths. I have been designing on-site wastewater systems for over 20 years that feature high quality pretreatment (in a recirculating biofilter) and subsurface drip irrigation dispersal. Some of these systems are at rather “high end” houses, where people are quite “fussy” about their landscapes. And some of those drip fields are irrigating turf, which is proving to provide quite acceptable irrigation. For turf, you’ve got to use closer emitter spacing, and provide enough water that it will spread between the emitters, providing a uniform watering. If you put out too little water, you will indeed get a “stripping” pattern, with more lush growth along the dripline and less lush growth between them. This can be ensured in those systems by installing an automated makeup water system, so water in addition to what comes through the wastewater lines can be added to fulfill whatever irrigation cycle is deemed to be required. And despite much of the water running through the drip emitters being reclaimed wastewater, thus of lower quality than potable water, I have very rarely observed any significant clogging of the drip emitters. Part of that is, I’m sure, because I design the systems with automatic flush valves that do a “mini-flush” every time the hose array is pressurized. But even if the emitters were to clog, they can be “restored” by injecting chlorine or acid solutions. Of course, you have to use good materials if you expect the emitters to last. I exclusively use Geoflow’s “Wasteflow” drip hose for my “waste” water reclamation and reuse projects. Geoflow also makes a superior product intended for systems fed by city water that’s marketed by Toro. Not working much with “normal” irrigation systems, I am not up on which “normal” irrigation contractors might be willing and able to install drip systems. One that installed a couple of my “waste” water drip fields is Waterspirit. Sorry I cannot be of more help on that score. But I would be more than happy to design your irrigation systems, and with a design in hand, it should be easier to get a contractor to do it the way you want it done, instead of telling you why they don’t want to. I hope that you will persist, and do indeed maximize the use of highly efficient drip irrigation. As I’ve argued, it is a deep conservation strategy that society needs to adopt on a broad scale. Thanks again for your thoughts. Many good points David. Irrigation in agriculture and on domestic landscapes comprise our greatest chances of achieving a high conservation goal. But, it is not likely to be quick or easy, especially with many of our leaders mostly talking about spending many millions of our tax dollars on more dams, long pipelines or other “big splash” projects. I believe that the ag LEPA irrigation systems can operate at around 90-93% efficiency – dropping hoses with the heads pointed down into the crops and out of the wind, sun. But these systems can be very expensive and most ag producers can only switch with cooperation. SAWS had a program like that 10 yrs ago with the farms west on the Edwards Aquifer – the farmer would apply for a USDA grant for X%, SAWS would put in Y% and the farmer the balance. In return, the irrigator would sign over his saved water to SAWS until the current valued water repaid SAWS. Ag drip systems can be very effective both for conservation and improved crop production. Either surface or buried systems – depends upon the crops and soils, etc. Plastic mulch can be laid upon vegetable beds and hold soil moisture while preventing weed growth – laid down by tractors, some last two seasons. In several Texas areas, more research is needed or maybe just better decisions, to find more water efficient crops which will still provide the net profit the farmer needs to stay in business and support the local and state economies. In West Texas where I worked for years, the top 3 crops were also the top water users – irrigated cotton, alfalfa (for city horses), and pecans. Soil moisture monitors can and do tell ag irrigators when to irrigate – can also be used in home or city landscapes. Irrigation systems can be very wasteful if not properly designed and installed and maintained – correct pattern, large droplets so as not to blow and NO auto timers. Folks go on vacation, etc. it rains and the timers still irrigate. Urban landscapes – whether in a city, small town or a country home can be huge water users and wasters. Very few wood fences, walks, drives or streets grow even if watered – so why waste your money and our precious water? Rainwater Harvesting can be used at most homes, schools, etc. to provide much, if not all, of the landscape water needs if tied into drip systems in a Xeriscape or Wildscape setting. If desired, it can furnish clean drinking water or water to handle restrooms in schools or other large buildings. As you discuss on the curb strip, those areas are typically very bad to water, mow and trim. So, why not take out the grass and make a nice native plant bed with small, attractive gravel to step on when getting out of a car? Or even better, do away with them when laying out new subdivisions. Put the sidewalks against the curb and slightly slope the walk towards the home and landscape to utilize the runoff and keep it out of the streets. Sidewalks and driveways, if concrete or asphalt and not porous or able to absorb rain, should be sloped towards the landscape or possibly have a slight crown to drain rainfall to where you need it – not to the street carrying oil, gas, fertilizer or pesticides to our streams. Changing our ideas of home, business, civic buildings or park landscapes needs to change radically and quickly. Some very serious and tough conservation planning and projects are needed across Texas – fast. We have many power and energy alternatives, but “Water Is Life!” and has no substitute. Thanks for those thoughts, Mike. Surely we can also do a whole lot better with irrigation efficiency in the ag sector as well. That too can “add a new reservoir” for any number of cities.